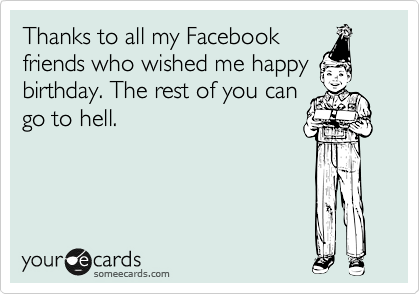 Your inbox and the Facebook wall must get bombarded with wishes on your birthday. It is kind of a formality to reply to all of them. Also, it would be impolite if you do not reply back. But aren’t you bored of the simple ‘Thank you’ reply after a Happy Birthday wish? 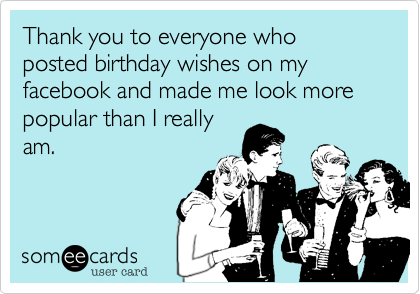 Imagine how boring it gets for the person who is wishing you and coming up with a unique birthday wish. Try to be funny and witty sometimes. Usage of sarcasm is highly recommended but only with people, you are extremely close to or else you would look very ill-mannered but a little sarcasm does not hurt. Right? Here, we are listing Top 40 funny birthday thank you responses that will lighten up your others’ mood as well as yours. At first, I couldn’t believe that you remembered my birthday. But then I realized that you have Facebook at your rescue. So, here, I want to thank Facebook from the core of my heart. Thank you so much for the thoughtful wish. Also, when is the birthday gift getting delivered? Oh no! You just burnt a hole in my pocket this year. You ate so much at the party, bro. Anyway! Thank you for the wishes. What? Just a boring birthday wish? Do not even expect me to give a birthday treat this year. I am highly disappointed with you. Did you not know that you are not allowed to my birthday party without a gift? I loved the card by the way. I am so touched to receive your wish. Thank you so much. But let me guess. You have not even bought my present, right? Buy one before showing up at the party tonight. Are you aware of the fact that I accept donations on my birthday? If you did not know this before, then it is not your fault. But know that you know, I expect a cute gift from you. I just realized that it is the same birthday wish that I sent your brother last year. You are such a sloth bear. Thank you, anyway. If you are thinking that this is going to be an emotional thank you note, then my dear friend, you are highly mistaken. I am here just to make my writing skills perfect. Considering you are such a lazy person, I just cannot believe that you even made an effort to wish me on my birthday. I am touched. Thank you, babe. I was sure that you would never miss my party because you love free food so much. Also, thank you so much for the beautiful greeting card. What? Seriously? Have you traveled ten kilometers just to attend my party? I should have known this because you would never miss free drinks and yummy cake for anything. Now, I see that you have started remembering my birthdays. Thanks to technology. Thank you so much for coming to my party. Anyway, you are here just for the party, right? You are so mean. Thank you, buddy. Now, do not even get me started on that greeting card. Your handwriting is so horrible. Kindly improve it. Thank you so much for waking me up at 12 o’ clock and ruining my beautiful dream. Now, please let me sleep in peace. Thank you for wishing me in French. I am glad you learned those words just for me. But please do not attempt to do it in public. Thank you so much for all the lovely presents and also for throwing the most awesome party ever on my birthday. Now, I also need to plan some good things for your birthday. I am so grateful that you took out some minutes from your precious time to wish me. 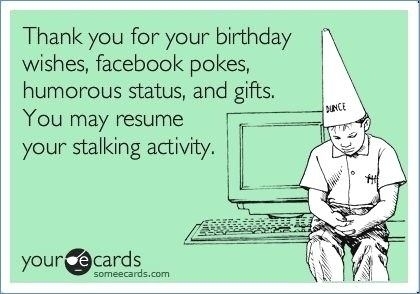 Now, please continue with your stalking work. I was not even aware of your existence. I did not expect a call from you at all. Thank you so much for reminding me that you are alive. I appreciate that you wish on my birthday but I rather prefer a gift for my birthday. Never mind but thank you. Facebook is a strange thing. I should rather than Facebook to reminds you of my birthday. Thanks for wishing me in advance for my birthday. I can feel that how eagerly you are waiting for the treat. Just a wish? Where’s my party? Where’s my gift rather? If there is none of them then do not ask for a treat then. 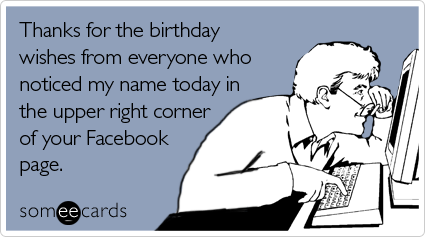 I would rather appreciate a custom-made birthday wish than the copied one. But thanks for wishing me. Thanks for wishing me but don’t ask for a treat because I am broke. Thank you for reminding me that I am getting old. Thank you for the humanity you show by wishing me for my birthday. You are awesome that’s why you send the birthday wishes to an awesome person like me. Thanks by the way. You do not like to fail, isn’t it? That’s why you do not fail to wish me on my birthday every year. Thanks though. Thank you for wishing me now save some space in your tummy cause you are coming to my birthday party. Do not take it as an invitation, take it as an order. Thank you for reminding my birthday before the Facebook reminder. You are a gem. I really care about what you write to wish me on my birthday but where’s my gift? I am happy that you wished me on my birthday but I rather prefer a million dollar cheque. Thank you. No more virtual chocolates on my birthday. Please wish me with a real one. Thank you for those 100 people out of 1300 who wished me on my birthday on Facebook. Rest of you can just go to hell. I love your wishes but I would love some blessings to live more for more chocolates and gifts. Thank you for your wishes but I don’t appreciate that you guys spreading my birthday news. This is wired to get so many attentions on a particular day. Thanks though for all your wishes but it are really wired. I know I am getting older. Your wishes remind me that. Thanks. I really shocked when I wake up in this morning. So many people wished me on my birthday. How can you guys remind and give the importance? Hence, we have concluded some unique and funny thank you replies for birthday wishes. There is nothing better than putting a smile on the face of the person who has put an effort for you. Try to make it extremely funny, unique and exciting.